Wouldn’t we all like to have sirloin steak and prime rib every night for dinner? Unfortunately though, in the real world, grocery budgets exist. One option is to go for generally cheaper meats, like chicken or pork, but beef has so much nutritional value that it’s best to have at least a little bit of it in your diet. You don’t have to be shelling out for flank steak and filet mignon to get some beef in, though! Here’s a guide to finding and cooking budget-friendly cuts that provide the nutritional benefits with a much lower price tag. Just to start off with, it’s important to look at the problem of “getting what you pay for.” Sure, you could absolutely save money by going for the bargain-basement quality food, but you’d also miss out on a lot of the nutrition you were hoping for in the first place! Food that’s actually lower in quality (e.g. supermarket meat is cheaper than grass-fed, because it’s actually less nutritious). This is the kind of “cheap” you want to avoid. Food that’s not lower in quality, but for some other reason, it’s not in demand, making the price low. This is the kind of “cheap” you want to snap up. When it comes to beef, a cut can be “not in demand” for reasons that have absolutely nothing to do with quality or tastiness. That’s what this article is about: cuts of meat that are perfectly nutritious and taste just fine, but for some unrelated reason aren’t in demand, so the price is low. 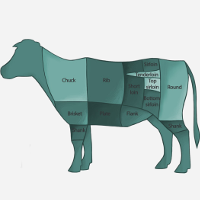 These are the cuts that give the savvy cook a chance to save big, even on grass-fed, high-quality meat. Cuts that are Cheap Because…They’re Needy. First on the list of “cuts that aren’t in demand” are cuts that take a long time to cook. Putting something in the oven for a whole day doesn’t fit very well with the hectically busy go-go-go of the modern life, so it lowers demand because everyone is looking for something they can get ready in half an hour. But where modern technology causes problems, it can also solve them! One way to solve the “long cooking time” problem is a slow-cooker: just “set and forget” the roast while you’re doing other things all day and come home to dinner ready to go. 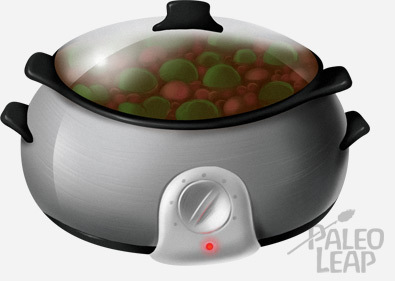 Alternately, use a pressure cooker to dramatically shorten the cooking time with the magic of steam pressure. You can get that “low and slow” effect and appropriately baby your pot roast without having to sacrifice your whole day! Perfect eye of round roast (The Domestic Man) – this one has a very interesting cooking method! Take a look even if you don’t plan to make it. And just to top it all off, here’s some Paleo gravy to go with any roast that calls for it! Another way to find cuts that aren’t in demand is to look for anything that most people consider “weird.” If you think of it, “weird” is a totally arbitrary standard (in many parts of Asia, it’s totally normal to eat insects, and you’d be the weird one for being grossed out), but the fact remains that most people only buy things they’re already familiar with, so anything perceived as “weird” gets left off the list. As the name implies, oxtail is the tail of the cow – and a cow is so big that the tail actually has a substantial amount of meat on it. Oxtail is particularly delicious in soups and stews because the marrow in the bones gives the broth a wonderful flavor without you having to do anything at all. Your neck probably wouldn’t offer much meat, but a cow is big enough that there’s quite a lot of good stuff on the neck. The meat here is best braised or stewed to coax out the flavor and tenderness – and don’t forget to save the bones for stock! Tongue is a muscle like any other muscle, and it tastes just the same. Beef tongue is essentially a lean roast – same taste, same cooking methods. It’s delicious, especially in tacos. The only reason people are squeamish about it is because it’s a tongue, but once you take off the skin and slice it to serve, you can’t even tell what it is. Just like tongue, heart is a muscle and tastes just the same as any other muscle. If you make beef heart and tell people it’s a roast, they’ll believe it. You (and the grocery bill) are the only one who will ever know! 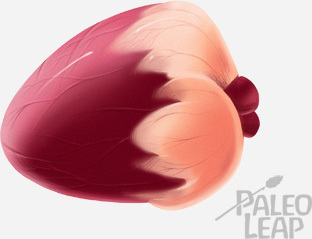 Tongue and heart might taste just like muscle meat, but liver definitely doesn’t. It has a very distinct, metallic flavor, thanks to its incredibly high mineral content. That’s an indication of health benefits, but it can also be a little tough for some people to swallow. One way to get around this is to use liver as an “extender.” Just the same way that meatloaf recipes use rice or oats to stretch out the meat, you can use liver to “stretch” the pricier ground beef in just about anything from chili to meatballs. For example, instead of buying 3 pounds of ground, you could buy 2 pounds of ground and 1 pound of liver, and save a few dollars every time. It definitely adds up! Bargain-hunting doesn’t have to mean settling for a lower-quality dinner or foregoing ethically raised meat in favor of the grain-fed variety. Sometimes, it just means knowing where to look: if you hunt for cuts that aren’t in demand, you can usually get significant savings because you’re one of the few people actually interested. Two great ways to make that happen are to go for cuts that require long and slow cooking (like chuck or pot roast) and cuts that most people consider “weird,” like tongue. They’ve got all the nutritional benefits of beef, but with a much more affordable price tag, even grass-fed!